Different federal and state laws provide very different definitions of the terms “disability” or “special needs”. You may be surprised to learn that many individuals whom their families, doctors, or communities consider to have special needs are not protected by all of the laws that use the word “disability”. Indeed, the courts often narrowly interpret the word to exclude some people with special needs. 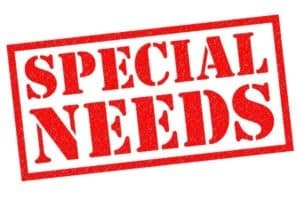 The Americans with Disabilities Act defines “disability” as a physical or mental impairment that substantially limits one or more of the major life activities of such individual; a record of such an impairment; or being regarded as having such an impairment. 42 U.S.C. § 12102(1)(A)-(C). The Act further breaks down the term “major life activities”, which include operation of a major bodily function, “caring for oneself, performing manual tasks, seeing, hearing, eating, sleeping, walking, standing, lifting, bending, speaking, breathing, learning, reading, concentrating, thinking, communicating, and working.” 42 U.S.C. § 12102(2)(A)-(B). This is not an exclusive list of major life activities. Whether the impairment “substantially limits” a major life activity is determined without considering the effects of assistive devices, medical equipment, or accommodations. 42 U.S.C. § 12102(4)(E). A number of court cases have significantly narrowed the scope of the ADA’s definitions of disability and related terms. See, e.g., Sutton v. United Airlines, 527 U.S. 471 (1999) (phrase “substantially limits” requires that the individual is “presently – not potentially or hypothetically – substantially limited in order to demonstrate a disability”); see also Toyota Motor Manufacturing v. Williams, 534 U.S. 184 (2002); Murphy v. United Parcel Serv., Inc., 527 U.S. 516 (1999); Albertson’s, Inc., v. Kirkingburg, 527 U.S. 555 (1999). Other federal laws define disability differently. For example, the Social Security Administration uses the following definition in evaluating adult eligibility for SSI benefits: “the inability to engage in any substantial gainful activity (SGA) by reason of any medically determinable physical or mental impairment(s) which can be expected to result in death or which has lasted or can be expected to last for a continuous period of not less than 12 months.” The SSA’s definition for children with disabilities is slightly different. In Illinois, the Human Rights Act defines “disability” as a “determinable physical or mental characteristic of a person, including, but not limited to, a determinable physical characteristic which necessitates the person’s use of a guide, hearing or support dog, the history of such characteristic, or the perception of such characteristic by the person complained against, which may result from disease, injury, congenital condition of birth or functional disorder”. 775 Ill. L.C.S. 5/1-103(I). As you can see, the Human Rights Act’s definition of disability differs quite a lot from the ADA and the SSA’s definitions. The Act goes on to list a number of limitations from and inclusions in the definition relating to various provisions in the rest of the Act; for example, mental, psychological, or developmental disabilities, including autism spectrum disorders, are considered disabilities for purposes of part but not all of the Act. Id. Further, the Illinois Department of Human Services Division of Developmental Disabilities has its own definition of “developmental disability” which differs substantially from the definitions use by the ADA as well as by SSA. There are many other state and federal laws that variously define the words “disability”, “special needs”, “handicap”, or “incapacity”. If you are interested in learning more about these different definitions under the law, start by reading this FAQ about how lawmakers developed the laws’ wording.